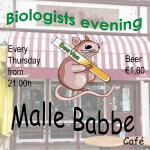 BeeVee has been the study association for (medical) biology students in Nijmegen since 1985. BeeVee delivers study books and study materials with a discount and organises study related activities such as lectures, workshops and excursions to companies. Activities such as an abroad study trip, sport activities, afternoon drinks and parties are organised with the aim of improving integration between students. BeeVee also has an association magazine (MOTjE) which is released several times per year and is filled with interesting articles and columns written by members. For more information regarding activities and the organising committees see the calender. You are also welcome to visit the board room of the Faculty of Science (HG00.150) every workday from 12:30 h to 13:00 h. To become a member follow this link or stop by the earlier mentioned board room. If you are interested in sponsorship deals with BeeVee contact the board.